I’ve decided to provide chess coaching services (services found on my “Schedule David” page, found by clicking here) for many reasons. The most-in-my-face reason is that I constantly field questions by tournament players, as well as some online players, the most ever-present being: How in the world did you improve your chess so quickly? When I played tournament chess between 2008 and 2010, I got the question regularly, especially toward the end of that period, when I began scoring against Experts –I am better than 20% against Experts in the 2000-2099 range. After not looking at a chess board in about four years –I left play due to migraines experienced as a result of diabetes, and other diabetic-related issues–, I have been able to return to study and competitive play, and I am getting questions much more now. What has compounded the interest of many players is that I’m an adult making this kind of progress, and adults typically a horrifically difficult time improving. Many adult players will sit in a 100-200 point rating band for 20 years, despite playing regularly and studying the game. I can name many examples. This all sort of a secondary reason for availing myself for formal coaching and advising –in “advising,” I mean to say that I will also be offering the programs that I used for my improvement. Answering the number of questions put to me would otherwise be impossible without a practical means of making room in my busy schedule. I have always felt rude for holding my routines, etc. as closely guarded secrets; but not only does it take time to convey to a group of individuals, but it also took a tremendous amount of time in research to develop my training methods and routines. The major reasons I am offering my time for coaching are, in no particular order: 1) I want to promote youth chess that will blossom into and feed into the adult USCF (United States Chess Federation) tournament culture; 2) I want to do so more cheaply than professional, high-level coaches (many promoters of “Scholastic” chess are more interested in the parents’ wallets than promoting a healthy adult chess-playing population); 3) to encourage adult players, completely new to the game, to play in USCF tournaments and enter the American chess culture, which very badly needs patronage chess its dying chess clubs; 4) to give adult players some sense of what is necessary for an adult to improve rapidly at chess. This fourth point is one that’s near and dear to my heart, because I’ve had a number of people I enjoyed time with, while chatting at the Pittsburgh Chess Club, but who remained at 800-1200; and this is very demoralizing for many adults especially doctors, lawyers, and university professors who see children pass their rating and excel beyond them in a short time; and so, sadly, these ladies and gentleman excuse themselves from chess club culture and tournament chess culture. This ultimately means the death of chess clubs, which I have remarked upon: here. I’ll say a little more about these motivations, in general. As a philosopher, I am taken aback whenever I hear people professing that there is no practical benefit to philosophy. This couldn’t be further from the truth, yet I understand where this sentiment arises: many philosophers have described, explained, and variously interpreted the world, but, as one philosopher trenchantly observed, the point is to change it. “The good life” is one of these components of the world that has been inquired into, and that just about everyone desires; but who has done anything about acquiring it or helping others acquire it, while philosophers still discuss it? I genuinely believe that the ability to think on the meta-level and self-reflect is the cornerstone of the good life; and I further believe that chess is one very effective way of developing an active, inquiring mind, which breeds these characteristics, as well as many other virtues (e.g., notions of personal responsibility, planning ahead, cause and effect, how to deal with failure, and so on). There are very few ways in which I could make worthwhile use of my time and pedagogical services for youths, and chess affords the best venue for me to do so. On the point of getting new adult players into chess culture, I believe my research has yielded a training style that is extremely effective in inducing chess improvement, and it may be the most effective means out there. 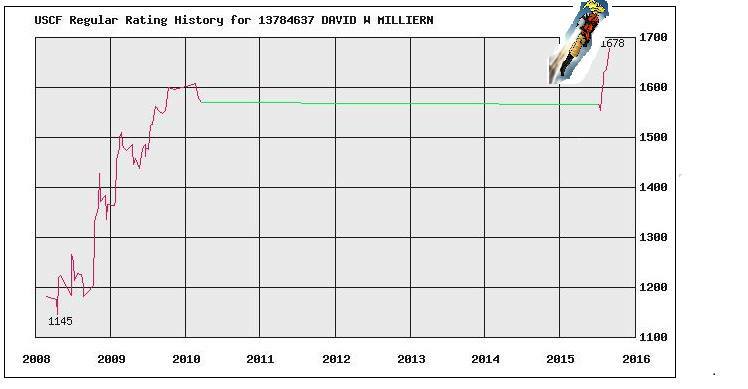 Take a look at my USCF tournament graph. The result of seeing improvement is encouragement to remain in the chess culture, and to engender a love for the chess culture that my spur on involvement in chess clubs, even if chess improvement does not continue beyond a point. I’m certainly not a person who can be seen has possessing any natural gift for chess: I stunk very badly when I began playing, and I was very fortunate to get as high of a rating as I had –in my first tournament, one player offered a draw when he was whipping me, and another resigned because he thought he was losing a piece but could take back (and he was winning)…my first rating should have been about 550! Perhaps the biggest reason to play or teach chess is that it is the great social equalizer. Each game marks a new beginning, and the game constantly brings together people of such disparate backgrounds –people from different communities, genders, cultures, nationalities, social classes, etc. When seated around a board, kibitzing, there may be no better unifier of a numerous people’s humanity than chess, and maybe chess is a road to the good life, not just within a single individual, but within humanity, as a way of establishing care for others through a common intellectual interest, vanquishing the “otherness” of others from our minds, and thereby instituting a greater sense of social justice. 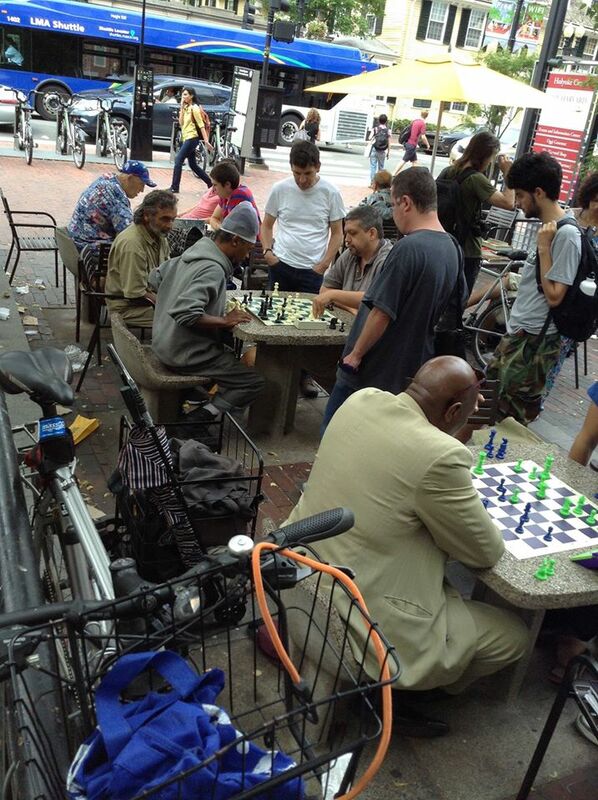 Chess, the great social equalizer. The biggest issue that I had was that, being that chess is a sport that requires physical performance (i.e., optimal brain performance), I could not regulate blood sugar over random shorter periods of time, such as at game time, and the coming-and-going of migraines was unpredictable, making it impossible to compete and difficult to train in addition to my university studies. Youth Education has become increasingly important to me. So much so, that I have temporarily set aside my formal philosophy studies (I am about two years away from my PhD in philosophy) to pick up an MAT equivalent, so that I may have some, as of now undecided, involvement with education. My wife’s thoughts on arts-integrated education, as well as the speeches and work of Sir Ken Robinson, continue to inspire my involvement with youth education.